Focus on Girl Child Education and Develop the Nation, donate your small contribution to make a happy life of Girl Child. Your Rs.15-20 per day contribution make your Rs.600 Contribution for a Girl Child Education and create a develop Nation. Come and Donate Now as much you wish. RENU Foundation’s education programme aims to help girls complete primary education and access formal schools, provides onsite academic support to enhance the quality of teaching, and nurtures leadership skills among girls. 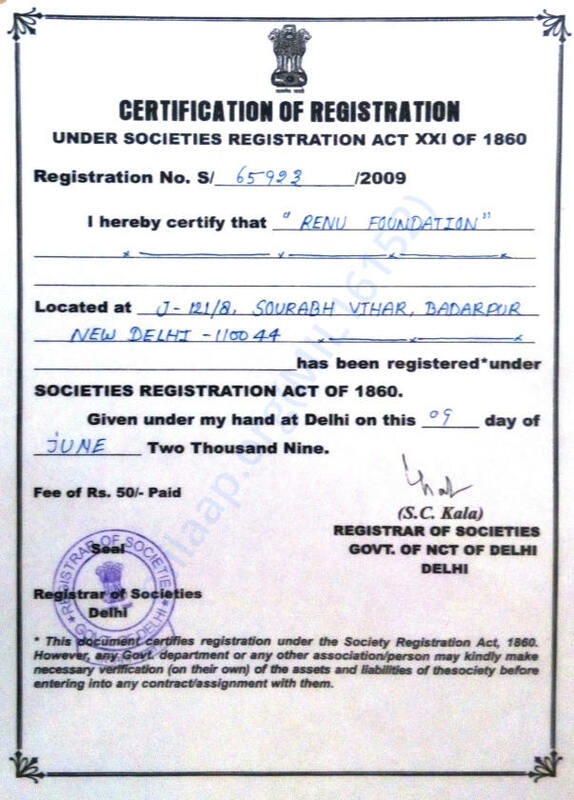 RENU Foundation provides technical support to teachers and government departments, helps nurture school-community relationships, and offers alternative education opportunities for women and girls from marginalized sections of the society. 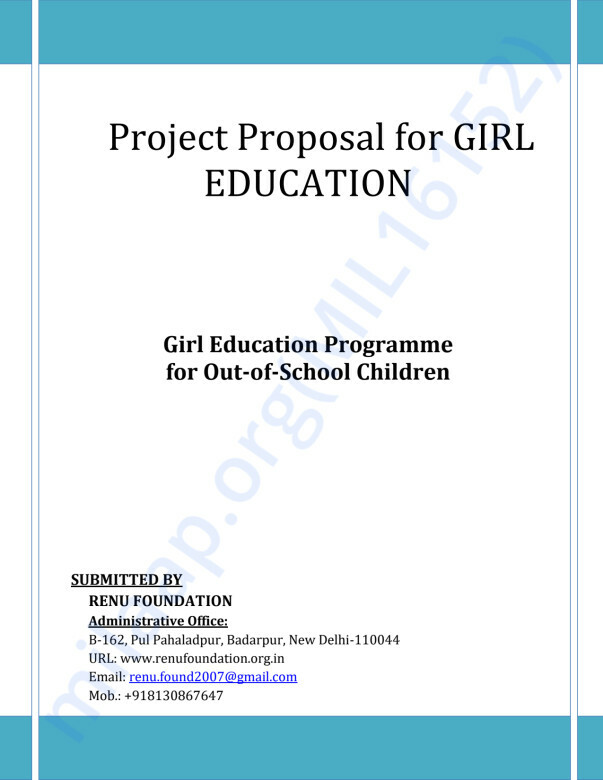 Girl Education Programme for Out-of-School Girl Child. A house to house survey will be conducted to identify children from target group. DURATION:Three hours a day6 days a week (Mon-Sat) – will follow local school holidays. GROUPS:Each Centre will have 2 groups depending upon age and educational background:First group: Class 1 & 2Second Group: Class 3,4 & 5 METHODOLOGY:A house to house survey will be conducted to identify the out-of-school children among the target group. The parents of the child will be persuaded to send children to our Centre. A child will be motivated to attend the GIRL EDUCATION Centre. A personal care of child will be undertaken. 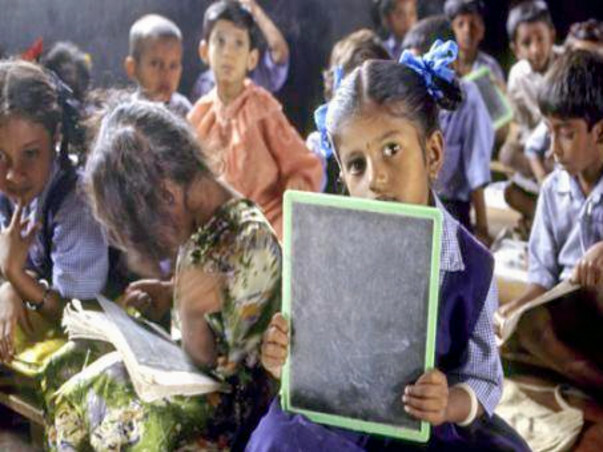 If a child remains absent from GIRL EDUCATION Centre for more than 2 days, the teacher or counselor will visit his/her home to find out the reason. Free books, copies, (if possible uniforms), shoes will be provided. Supplementary nutritious food will be provided by the Centre. A teacher will handle a group of approx 25 students only. There will be 2 such groups. Therefore at each Centre, there will be two teachers. These teachers will be volunteers who will be paid honorarium. Each child will receive training from the teacher depending upon his/her educational needs. Contacts will be made with the nearest Government schools/ private schools to give admission to such children after completion of training. In addition to formal education, children will be encouraged to participate in other co-curricular activities (games, cultural programme, outings. Sports, celebration of festivals etc.) organized by the GIRL EDUCATION Centre. There will be provision for classes on ‘moral education’. A monthly evaluation will be done by the teacher / programme officer on regular basis. A separate file on child’s progress will be maintained which will be reviewed regularly to find out the potentials as well as remedial actions. A psychologist/counselor will visit each Centre at least once a month. The GIRL EDUCATION Centre will follow up with the school where the child is admitted at least for one year to avoid further drop-out. Each child will be treated as individual and personal attention will be paid to each child. Teachers will be trained to treat each child with sympathy and love. Providing remedial coaching to weak students after mainstreamingBACKGROUND:It has been observed that once a child is admitted in a school after training, he/she may not be able to cope with the school pressure or not able to understand some subjects. This results in further drop-out leading to failure of the efforts. 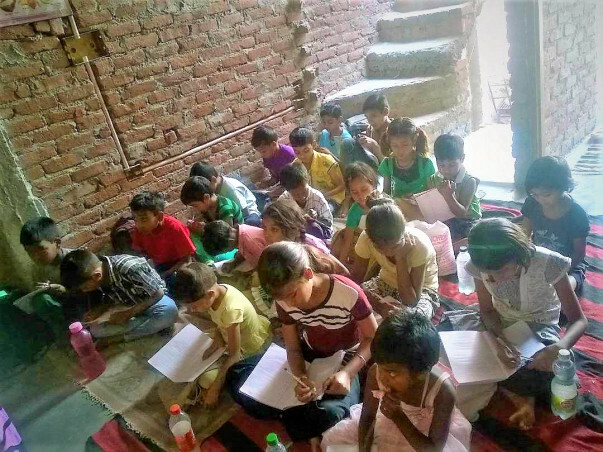 METHODLOGY:To help these children, an after-school coaching facility will be provided by GIRL EDUCATION teachers wherein such children will be helped out in solving their problems and home work. There may be nominal fee for providing such coaching to these students. This will help them in continuing their studies even after leaving the GIRL EDUCATION Centre.From time to time, other activities like picnic, outings, games, celebration of festivals etc, will also be organized so that these children remain engaged in the GIRL EDUCATION activities. DURATION:2 hours a day, 6 days a week.At least for one year after leaving GIRL EDUCATION Centre. GROUPS:Children will be divided in groups according to their class.In addition to normal study, they will be given training on Personality Development from time to time. Providing knowledge about personal hygiene and healthIt has been observed that most of these children lack knowledge about personal hygiene and health. This further results in their disorientation, and absenteeism.The training on personal hygiene and sanitation helps children to consider improving their lifestyle to reduce disease and infection. Promoting effective and low-cost sanitation, encouraging good hygiene and improving access to clean water supplies helps children to live healthier lives. Young children and babies are particularly at risk of infection and disease from poor sanitation, poor hygiene practices, and dirty water. The training helps children to reflect on the particular challenges in their own living situations that make access to effective sanitation and safe water supplies difficult.Each topic in this training is designed to encourage small group discussion in a relaxed and open manner. The guide aims to build children’s understanding of the basic facts about good hygiene.Starting with small instructions like brushing the teeth, combing, daily bathing, nail cutting etc. children will be trained on bigger issues like save water, clean clothes etc.This training will help to build their self-esteem.Providing health check and follow-upPoverty is at the root of many of the nutritional and associated health problems, but the children who will be born over the coming decades cannot afford to wait for a new economic order to provide the solution. Through the promotion of health checkup and follow up, necessary help can be targeted at this vulnerable population.A medical checkup of each and every child will be done within 15 days of admission. This will include preparing their health card, identifying existing diseases including HIV, vaccination chart etc.The GIRL EDUCATION Centre will coordinate with hospital for any existing disease. A copy of health card will be given to the parents of the child. The teacher will follow up the vaccination chart. Providing supplementary nutrition In India, severe protein energy malnutrition is one of the important factors associated with high infant and child mortality rate. The calorie intake of severely malnourished children was found to be low and insufficient in all the three age groups in various studies. Hence, direct intervention in the form of supplementary nutrition is necessary to be provided to malnourished children for improving their nutritional status. Under GIRL EDUCATION, in addition to formal education, a healthy nutritious food will be provided to all the children. In case of anemic girls, additional supplement will be provided. Where doctor has advised, we shall provide further nutrition.We shall have provide child-friendly menu that keep changing. Sometimes, pre-cooked food like dalia, halwa, sometimes fruits, sometimes parathas etc. will be provided. 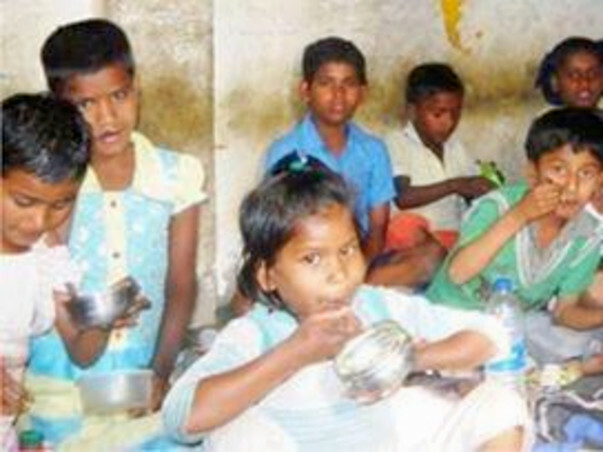 It will be ensured that children eat the food provided in the class. Training of parents on education, sanitation, health and nutrition of childrenParents play a pivotal role in child education. Regular meeting with parents is therefore necessary for continuation of education of the children.RENU Foundation) will maintain close interaction with the parents of the children on regular basis. A monthly meeting will be organized with the parents. Also, the teacher will visit their homes on regular intervals and discuss the issues related to education, sanitation, health and nutrition. Project Manager: The project will be managed by the CEO of the RENU Foundation. Project Officer: There will be a separate Project Officer who will manage the entire project, provide day to day directions, liaison with the different authorities and the funding agencies, prepare MIS and coordinate with the Project Manager. The minimum qualification will be Post Graduate. Teachers Volunteers: Min. : 10+2. Formal Training in teaching will be preferred. He/She will be responsible for educating the children, taking remedial classes and coordination with parents, doctors, visitors etc. All the teachers will report to Project Officer. Accountant: B.Com. Will be responsible for maintaining accounts of all the projects, petty purchases, day-to-day administrative work, record keeping etc. He will report to Project Officer. Maid/Aya: will be responsible for upkeep of the GIRL EDUCATION Centre and serving nutritious food to children. Project Monitoring & EvaluationEvery month a review of individual GIRL EDUCATION Centre will be held with the Project Officer, Teachers etc. in the first week of the month. A child wise progress report will be updated. Every month a project review meeting will be held with the Project Manager to be attended by all the teachers, Project Officer and the Accountant. The progress of overall scheme, objectives will be discussed and documented. A comprehensive monthly report will be prepared by the Project Officer. The teachers will be responsible to update child’s progress file every month. At the end of 3 months, all the children’s file will be reviewed by Project Officer/ Manager. Monthly Income & Expenditure will be prepared and compared with the budget. At the end of the quarter, a quarterly progress report will be submitted to the funding agency. At the end of the year, an income-expenditure report will be prepared for the GIRL EDUCATION as a whole and will be audited by a Chartered Accountant. A copy of the audit report will be submitted to the funding agency. At each Centre, a 5-member monitoring committee will be formed consisting of 2 teachers, one project officer and 2 parents. This committee will meet from time to time to review the progress of the Centre. Proper minutes of these meetings will be maintained. At the end of the year, at least 70% of the children enrolled should be admitted in government or other schools. School bag + books etc. Total cost for one Girl Child for a Year = Rs 2560 Only.